Don’t tell my hus­band, but I’m madly in love with my daughter’s Plan­et­Box Rover. I started lust­ing over the stain­less steel, “eco-friendly” lunch con­tainer years ago after spot­ting it on Face­book. On any given day, it seemed that I’d see a Plan­et­Box filled with the kind of school lunch that I aspire to: fresh, healthy, cre­ative, and col­or­ful. I wanted one badly but, let’s face it, they aren’t exactly cheap. About a year ago, I finally bit the bullet–and, as they say, the rest is history. So what exactly is so great about our Plan­et­Box? I thought you’d never ask. 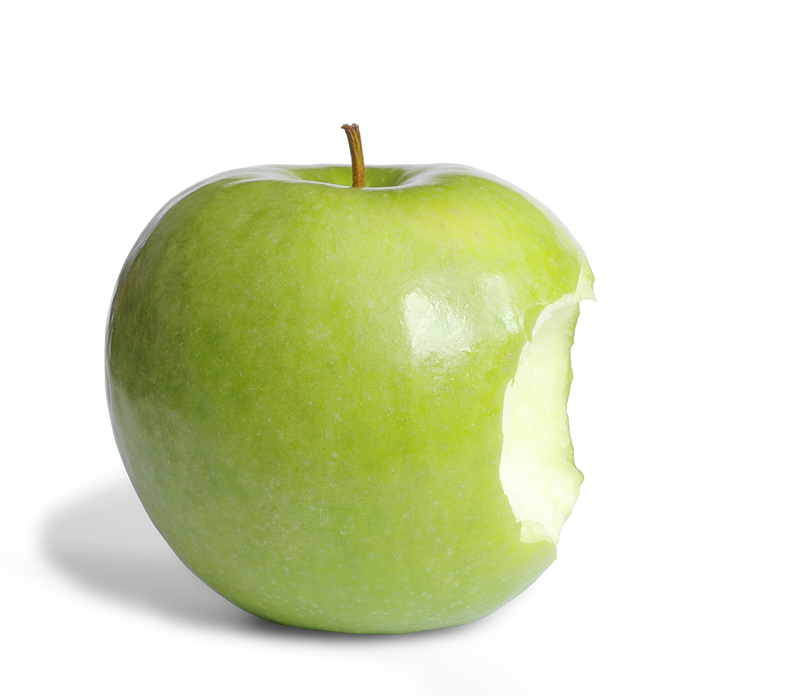 * Foods stay sep­a­rate Thanks to seg­mented com­part­ments, foods don’t touch each other. In other words, no need to worry about (ewwww!) your child’s kiwis get­ting mixed up with her peas or (yuck!) straw­ber­ries get­ting mushed or turn­ing his sand­wich pink. * Small con­tain­ers fit inside Want to pack yogurt, or another food with the poten­tial to get messy? Put it in one of the two small stain­less “dip­per” con­tain­ers that come with the system–they fit right inside (or in the outer pock­ets of the car­ry­ing case). * Lunch looks yummy When it comes to a great meal, we all know that pre­sen­ta­tion is key. Plus, kids love choices! 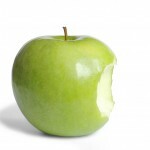 Research has shown that they eat bet­ter when pre­sented with a vari­ety of dif­fer­ent foods. * No more plas­tic bag­gies You can ditch the Ziplocs, which are unhealthy for the envi­ron­ment (and can really add up cost-wise). * It’s easy to clean Just pop it in the dish­washer and you’re done! Ours eas­ily fits in the lower rack. * Con­ve­nient car­ry­ing case The case (which comes in a bunch of dif­fer­ent col­ors) has two out­side pock­ets where you can pack extra snacks or even a ther­mos of warm soup for an entire day’s worth of yumminess. Our Plan­et­Box Rover sys­tem really is the best. That’s why I’m happy to be able to give YOU a chance to own one, too. THE GIVEAWAY IS NOW CLOSED!!! WINNER IS LENORE SMITH. THANKS FOR YOUR INTEREST! PRIZE: One lucky reader will receive a Plan­et­Box Rover Com­plete lunch set (RETAIL VALUE $59.95), which includes: a stain­less steel lunch­box, mag­nets (for dec­o­ra­tion), two small “dip­per” con­tain­ers and a carry bag. The win­ner will get to chose the bag color and mag­nets (sub­ject to availability). DURATION: This give­away is open until Tues­day, Octo­ber 14, 2014, at 11:59pm. THIS GIVEAWAY IS NOW CLOSED! ELIGIBILITY: Open to res­i­dents of the USA only (sorry, no Canada!). HOW TO ENTER: Leave a com­ment below stat­ing why you want a Plan­et­Box Rover. That’s it! For more chances to win, share this give­away on Face­book and Twit­ter and leave a sep­a­rate com­ment for each so I know that you’ve done so. HOW WINNER WILL BE CHOSEN: The win­ner will be cho­sen at ran­dom and noti­fied via email. Win­ner will have 48 hours to respond or a new win­ner will be chosen. Dis­clo­sure: This Rover Com­plete lunch sys­tem has been pro­vided by Plan­et­Box, but I have not been com­pen­sated in any way. All views and opin­ions expressed are 100 per­cent my own. Why are you inter­ested in own­ing this Plan­et­Box Rover Com­plete? Leave a com­ment below for a chance to win! Con­test ends Tues­day, Octo­ber 14, at 11:59pm. THIS GIVEAWAY IS NOW CLOSED. THANK YOU FOR YOUR INTEREST!! If you’re a par­ent or teacher who val­ues healthy food, be sure to check out A Year of Healthy Class Par­ties: A Plan­ning Guide for Par­ents & Teach­ers. I would love to have this lunch box! I enjoy pack­ing fun and healthy lunches for my girls. We are always look­ing for bet­ter ways to pack lunches. Oh my! I absolutely love this! I really would like to win this because it keeps all food sep­a­rate, and the car­ry­ing case is wonderful! I want a Plan­et­Box since our favorite Ziploc con­tain­ers were dis­con­tin­ued! I won­der if these fit in the Land’s End lunch boxes? My son takes his lunch every­day. I would love to pack his lunch with­out plas­tic bags! Eat­ing healthy is impor­tant to me & for my fam­ily, & this does not stop whe. We leave the door. So being able to own a Plan­et­Box would be won­der­ful for this Mommy who packs for 2 kids, & a hus­band who eats many meals at work!!! I send lunch with 3 kids so they can eat healthy. We’d love to have non-plastic containers! I love to make healthy cre­ative lunches for my daugh­ter, this would be the per­fect way for her to bring them to school! I would love to own one. We started Fg about a year ago and have noticed a huge dif­fer­ence. Last year I was just learn­ing about this so I wasn’t so strict about what the kids were eat­ing. But this year I am ded­i­cated to my kids eat­ing right and being suc­cess­ful in this and that lunch­box would sure help with con­tin­u­ing our suc­cess. I would love it if you picked me I have 2 chil­dren who love this. I want some­thing that won’t poi­son my kids and as an added bonus will not leak! My son has had one for a few years, and now that my daugh­ter has started school she wants to be just like him and wants one of her own. Love that lunch­box! I know my daugh­ter would love it, too! I love this! This is SO much bet­ter than plas­tic bag­gies, which I am really try­ing to get rid of, and I’d like to not have ANY plas­tic con­tain­ers in my kids’ lunch­boxes. I espe­cially love how the food stays sep­a­rate — I am so tired of my son not eat­ing his lunch because one thing has “run into” another food item and there­fore he thinks it’s now gross. Plus, I love the addi­tional small con­tain­ers to hold dress­ing for veg­gies, or yogurt, which they eat plenty of. The price is steep, but if I love it enough I’ll def­i­nitely buy one for my other child:-) Ooh, I hope I win!!!!! my 3 girls have one and we live them. My son started preschool this year and we haven’t picked one up for him yet!! This would cer­tainly make going out with a tod­dler who has dairy issues a lot eas­ier. Plus make it fun for her to have a pic­nic lunch. I love that it’s stain­less steel and leak proof! My daugh­ter loves the name, the look and the idea of sep­a­rated healthy food. I’d love a Plan­et­Box Rover to pack lunches for my lit­tle girl! Also shared this on the Bento for Baby Face­book page! We love our Easy Lunch­boxes but the Plan­et­box sys­tem is VERY tempt­ing! The dif­fer­ent com­part­ment sizes look like they would make for a very appeal­ing lunch. I’d love to pack my daughter’a lunch in some­thing so organized! My 4 year old has a dis­ease that makes eat­ing very dif­fi­cult, there­fore he’d rather not. The Plan­et­Box Rover lunch set would give us a new, fun way to present his food, which always makes meal­time eas­ier! I love how each com­part­ment stays sep­a­rated, which is very help­ful with kids who have sen­sory issues and don’t want their foods to “touch”! I soooo hope I win this!!!!!! Have a great day! I’m shar­ing this with all my Face­book friends!!! I would love a plan­etrove lunch­box for one of my kids, so I can get away from all the plas­tic in my house. This would be great for my son because he is one of those kids who hate when his foods touch! WOULD LOVE one of these for my kids to try out. We have so many trou­bles get­ting lunches packed…and i’d rather use stain­less than crappy plastic! i’d rather use stain­less than crappy plastic! I would like to win one of these because we love to make bento style lunches for my one year old and I love the idea of stain­less steel!! What a cool lunch­box! The mag­nets are a cute added bonus! 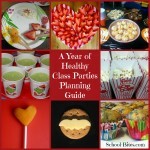 I’d love one for my lit­tle guy to bring his healthy lunches to school in! I have been want­ing one for­ever, but it’s just not in our bud­get. I don’t feel great about the plas­tic con­tain­ers I’m using for my girls, but it’s what we’ve been stuck with. I would be so excited to win this! I would like to give the Planet Box Rover a try to see if it works bet­ter for us than our cur­rent boxes. I’ve always heard good com­ments about this brand. Thanks!! Thanks for keep­ing us posted on all the cool mate­r­ial that is avail­able to keep our kids and planet healthy! Ive always been a healthy cook for my kid­dos but this past sum­mer the fam­ily went on a fruit and veg­gie jour­ney. We tried every type that my local farmer’s mar­ket and gro­cer sold. My mid­dle schooler was so inspired (and repulsed once return­ing back to cafe­te­ria lunches) that she is work­ing with her prin­ci­pal and teach­ers to sur­vey the stu­dent body about changes to the lunch room foods. She has also had vol­un­teers for her school gar­den idea. I would love for her to have this lunch kit to rein­force her pos­i­tive pro­mo­tion of healthy foods at school and let her be an exam­ple to her class­mates that eat­ing healthy can be tasty and fun! The Plan­et­Box smooth design caught my eye a few years ago but the func­tion­al­ity of it is really where it’s at. I love the stain­less steel mak­ing it super easy to clean (noth­ing worse than a stinky lunch box) and the sep­a­rate food com­part­ments are nice too. I love how fun my kids lunches look in PlanetBox’s…so fun! Plus, the ben­e­fits to the envi­ron­ment are a won­der­ful bonus! Hi,I am new to this eat­ing clean & healthy & reaaly trimg hard for myself & kids sake.They are lov­ing all the fruits & &star­ing to like the veg­gies 🙂 I would love to win one of these to pack for their lunches! Thank you ! I want a Plan­et­Box Rover because I like to give my daugh­ter options for lunch. This is a great solu­tion because it is a fun way to present the food and it is a good way to do some­thing great for the earth! My daugh­ter would love this. She packs her own lunch and this would make it much eas­ier for her!! Love the choices of covers! Id love to win, because my son is just start­ing preschool and Id like to not get into the lunchtime rut of using bag­gies and prepack­aged food. He loves a vari­ety and I already enjoy fol­low­ing the mommy blogs that are geared toward mak­ing cool lunches. He is such a lit­tle foodie too. Always will­ing to try every­thing and loves most of it. He has a big appetite too, so this would be a great size for him. These are fan­tas­tic! I’m always try­ing to find ways to pack my daughter’s lunch as “clean” as pos­si­ble! I’ve pur­chased a stain­less water bot­tle (which was sent home with a note that it was too tall to fit in the cubby and could we please pur­chase a smaller “typ­i­cal” one, ie. PLASTIC!) and the teacher insists I pack snack in a brown paper bag every day, sep­a­rate from her lunch. I had been send­ing in the same paper bag day after day (she was prob­a­bly the only kid in there with a wrinkly “soft” bag), but I was try­ing to waste as lit­tle as pos­si­ble. These are the best of ALL worlds. Reusable, stain­less, styl­ish (pink?!? Haz­aah!). I love ‘em! I’d love to win this because with four chil­dren you can never have enough sup­plies to send a healthy lunch! I wanted to buy two of these for my two old­est for lunches this year but couldn’t afford it at te moment. This would be a great start!! Oh my gosh, my daugh­ter would LOVE this! This would be per­fect for my daugh­ter. She is in Kinder­gar­den. We were pack­ing lunches at first but she says that there were to many boxes or bag­gies to open and some­times she looses the con­tain­ers. So she has been eat­ing school lunches. I have been look­ing for some­thing else like these bento boxes. But most are pricy. it would be nice to win one. I would love to win one of these! Our cur­rent box only has 3 com­part­ments and I can’t fit in another con­tainer for dips. Looks like a good system! Would love the planet box for my girls as we have still the plas­tic ones (bpa free though still…) for our healthy lunches… Would be super to win so I only need to buy one instead of two!! I would love to win this because it would make pack­ing my lunch so much eas­ier, quicker, and cleaner. Need to con­trol the CHAOS!! Plus my daugh­ter and son have been ask­ing and ask­ing for one. This Mama needs to sim­plify and save our san­ity ???? with easy lunch box packing. I would love to have this box for my daugh­ter. A friends of ours has one and loves it! We went for a less expen­sive, plas­tic bento-style box and it is dif­fi­cult to open and I don’t love that it’s plas­tic. I strive to keep my daugh­ters as healthy as can be but the cost of items like these is pro­hib­i­tive. I would love to win one!! Thanks for the opportunity. I would love one of these, cause I am tired of plas­tic split­ting, break­ing, leak­ing, crack­ing and pil­ing up on our land fills. My twins would love a Plan­et­Box Rover lunch box! They do not like school lunches so we pack a lunch daily!!! This would be so ccoi!!! I’d love to win one because my son packs his own lunch and with one glance, as opposed to hav­ing to open and look in mul­ti­ple plas­tic con­tain­ers, I could check over whether his lunch is “com­plete” and has the required 2 serv­ings of fruits and veg­gies, 1 serv­ing of pro­tein and at least 1 serv­ing of carbs that I require him to pack each day. I also think it would cut dras­ti­cally down on the wan­der­ing around the kitchen aim­lessly time while he’s think­ing about what he might make as at least he could con­cen­trate just on the fridge and the food cup­board and wouldn’t have to make mul­ti­ple trips to the con­tainer drawer. My son would love this! What a great way to pack a lunch. This is way too cute and a neat idea for cre­ative lunches! I would love to win this lunch box for my son! His birth­day is com­ing up soon and this would be a great gift!!!! Recently i started pay­ing more atten­tion to every­thing around my fam­ily; we try to eat more healthy, use less plas­tic bags and water bot­tles etc. so this Plan­et­Box would be a great addi­tion to our routine!!!! I love that there is only one lid to open and no small pieces to lose. It makes things much eas­ier for younger kids, espe­cially given the short amount of time they have for lunch. I would love one of these for my younger son. For my older son, I have used Ziploc sec­tioned plas­tic con­tain­ers for a sand­wich and two sides. Younger son is wheat and dairy free, so no sand­wiches. I have been par­ti­tion­ing the big sec­tion with sil­i­con cup­cake cups, but it isn’t ideal if we have wet things. I have been slowly replac­ing all of our plas­tic items with glass, bam­boo, and stain­less steel for good health. I would love to use a planet box to make healthy lunches for my girls to take to school. They are so much bet­ter than the plas­tic boxes we use! My kids pack their healthy lunches each night but my 9 year old is the one that is totally into it with cut­ting her sand­wich, veg­gies & fruit var­i­ous shapes. 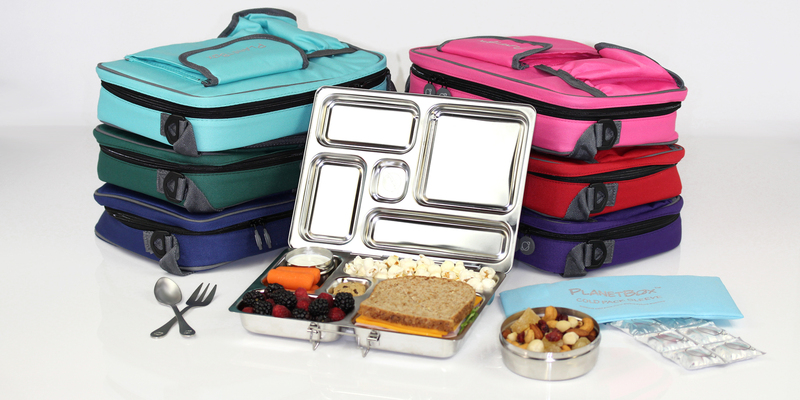 She would LOVE the rover lunch box to help orga­nize her 5 food groups in her lunch. She uses col­or­ful sil­i­cone cup­cake cups to divide her food groups now and those aren’t fun to wash & some­times get stuck in the dis­posal– yikes! The rover would keep every­thing in its place with one piece to clean. It would make eat­ing real, whole & healthy a lot more easier! I’ve been want­ing one of these only for for­ever! I would LOVE to win!! I LOVE no waste lunches! My son will be going to preschool “lunch bunch” this year and I’d love for him to be able to see his entire, col­or­ful lunch in front of him instead of bag­gies that could be hard to open. Love this! Thank you! I love the idea of nit using plas­tic bag­gies! Great con­cept and would like to try out! I would love to own one!! These look so nice and durable. I would love them to pack my fiances lunches for work in. I would love to have one for my lunch for work. love love love planet box! I have been want­ing to pur­chase a Rover com­plete set for almost a year now. I have seen the many cute and healthy lunches that are packed and it would make my grown up lunch life so much more fun! After all, grown ups need to eat lunch too. I would love to have one of these. So styl­ish and eco friendly! I want to win this for my daugh­ter to use at co-op this year. She likes liv­ing green and this will help her to do so. I have two dia­betic grandson’s, that I have cus­tody of, these would be great for our 3 month check-ups at the dia­betic clinic that takes all day vis­its. So much bet­ter to pack a lunch then going thought fast food places. I would love to win! I think this would encour­age my chil­dren to eat health­ier, as well as think­ing more about the environment. I pack my daughter’s lunch every day and would love to try this one. It looks per­fect for us. My kids are want­ing to take their lunches & this would def­i­nitely encour­age it! Plus, it’s super awesome! This is SO much nicer than putting every­thing in baggies. I want to win because this would be more eco­nom­i­cally friendly than the paper and plas­tic bag­gies i use currently! You have no idea how many times I’ve been on Ama­zon try­ing to find the PERFECT lunch­box. To no avail. But this is it!. Dish­wash­er­friendly and with big enough com­part­ments. Thanks for the scoop! I hate using plas­tic bag (wait, I never use them). I use Tup­per­ware con­tain­ers but the lunch bag gets bulky with all the con­tain­ers. The Plan­et­box Rover is great because every­thing goes in one con­tainer, which would solve my bulky problem! I would love a Plan­et­Box! I would love to elim­i­nate the use of plas­tic bags to help reduce our waste. This is great!!! I bring lunch with me less often than I eat out. Would love to start sav­ing on my lunch allowance. Eat­ing cleaner=saving money=a hap­pier me. I’d love to win a rover because it is Eco-friendly and super cute! This would be great for my daughter’s lunches. I want to win because I think this is a great way to take lunches to school with­out using plas­tic bags and other dis­pos­able containers. This would be great for my son to take to school. I would love to own this for my chil­dren to be able to take healthy lunches to school in this fab­u­lous box! I hate pack­ing lunches with lots of plas­tics that go to waste, but some­times there is no other choice. This would fix that problem! 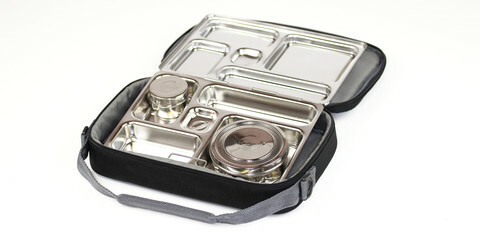 I would love to pack lunches in the Plan­et­box. One con­tainer for kiddo to open at lunch and know­ing I can get it really clean! This is so cool. I love how it’s an all in one set, and easy to clean. My chil­dren really dis­like school lunches, but their lunch­bags are messy and every­thing gets mushed and spilled. This would solve that dilema! Thanks! I would love to win this awe­some Plan­et­Box Rover because I want to pack my home­made lunch when I go school, work and vol­un­teer! What a won­der­ful give­away! Here’s to our health! Love this give­away! I’m so totally into cool lunch gear!! I would Love to win for my son because he takes his lunch to work because we all eat healthy and he has a hard time keep­ing his lunch fresh and this would help him with his healthy lifestyle. I would love to win this b/c I home school my 9 year old & I have a 1 year old. There­fore they are with me 24/7…and they BOTH seem to become hun­gry to a ridicu­lous extreme at the most inop­por­tune time. With this I could pack them both a good lunch to take. I have a picky eater and I think she would be will­ing to try more foods if packed in such a fun con­tainer. Plus, she will need a good lunch­box when she starts school in a cou­ple years. I would love to win the Plan­et­Box Rover Com­plete because my daugh­ter takes her lunch every­day & she would love how it keeps the food seperate! I love the way this keeps foods sep­a­rate. It would encour­age me to pack healthy lunches! I would love to win this because I’m in the process of try­ing to phase out all of my plas­tics. This looks like a healthy and awe­some product. I would love one for my boy’s snacks and lunch. this would be a cool win for my son! My grand­daugh­ter is eat­ing lunch at school for the first time and would enjoy it. Very Nice, would love to win it! I make my husband’s lunch every­day this would come in sooo handy! I would love to win this for my grand­daugh­ter whose lunch is always get­ting smooshed and/or stepped on before lunchtime. Gen­er­ally this hap­pens while on the bus in the morn­ing. This would be a per­fect solution. I love it! I would love to give this to my nephew. He would get a real kick out of it! I’d love to give them a try for my kids lunches. Looks fan­tas­tic. Would love to win so I can try them! Thanks! Susan — I’m very sorry, but the give­away has ended. I will be giv­ing away some Kids Kon­serve stainless-steel water bot­tles and food kozies in a cou­ple weeks. If you’re inter­ested in other re-usable lunch gear, please check back! this would be great for my sons lunches at preschool!! Natasha — I’m very sorry, but the give­away has ended. Check back in a cou­ple weeks–I will be giv­ing away some Kids Kon­serve stainless-steel water bot­tles and food kozies. They’re awe­some, too!